The famous US Dividend Aristocrats are a select group of S&P 500 stocks with 25+ years of consecutive dividend increases. The UK Dividend Aristocrats Index is create by S&P and is based on a managed dividends policy of increasing or stable dividends for at least 7 consecutive year. In Europe it is not common to by default focus on paying dividend in a row to the shareholders. The UK Dividend Aristocrats are based (by S&P) on the 40 highest dividend-yielding UK companies within the S&P Europe Broad Market Index (BMI) and a managed dividends policy of increasing or stable dividends for at least 7 consecutive years. 40 highest dividend-yielding (UK), in the US the height of the yield is not a selection factor. The Dividend UK Aristocrats Excel spreadsheet contains the following fundamental and stock price performance metric for each stock in the index . There is also an European Dividend Aristocrats list, which entails European stocks with 10+ consecutive years of dividend increases or stable dividend. As explained the UK Dividend Aristocrats Index currently contains 40 stocks . 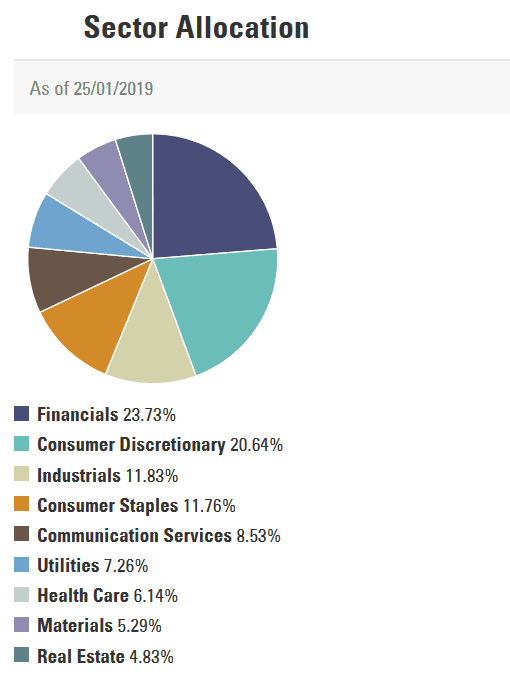 As you can see below, the Financial sector accounts for 23.7% of the index. Real Estate is on the other end of the spectrum at less than 5% of European Dividend Aristocrats Index. To compare, the largest US dividend aristocrats sector is Consumer staples. The UK Dividend Aristocrats are based on the 40 highest dividend-yielding UK companies with increasing or stable dividends for at least 7 consecutive years. High yields are typically seen as a warning sign that dividends are unsustainable. For the UK stocks one should keep in mind that dividend yields on (all) UK shares are at their highest level, on average 4.8%, since 2009. So the UK Dividend Aristocrats list will consist of many stocks above this average. Dividends continue to grow even while investors have concerns over the trade war, Brexit and interest rates. 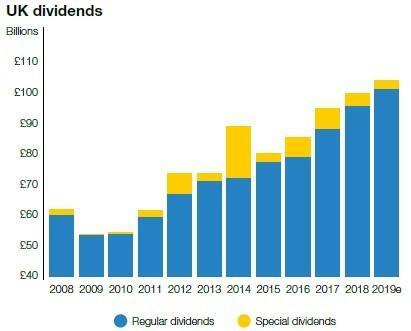 Rising profitability, more special dividends and a weaker pound helped UK dividends rise 5.1% in 2018 to a record GBP 99.8bn. Forecasts for 2019 are even higher and expecting the total dividends paid to GBP 104bn.